A repeat “Vintage” from 2012. . . 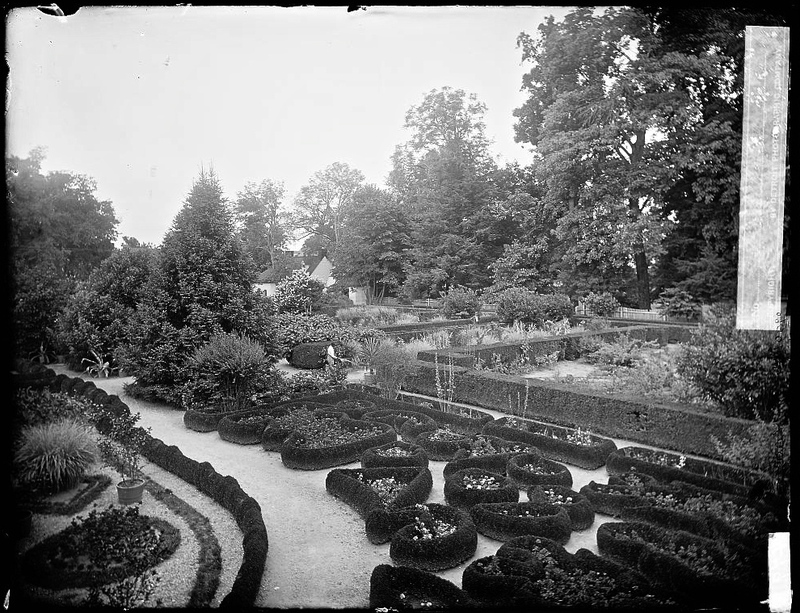 I love this 1902 photograph of the Upper Garden at George Washington’s home, Mount Vernon. It’s so high Colonial Revival. Early American Gardens has a post this week, “Mount Vernon after George Washington’s death,” with images from the 19th century. While looking at them I remembered the picture above and the two below. Above is a hand-colored slide from a 1929 aerial photo, part of the lantern slides collection of Frances Benjamin Johnston. The Upper Garden is on the right side. 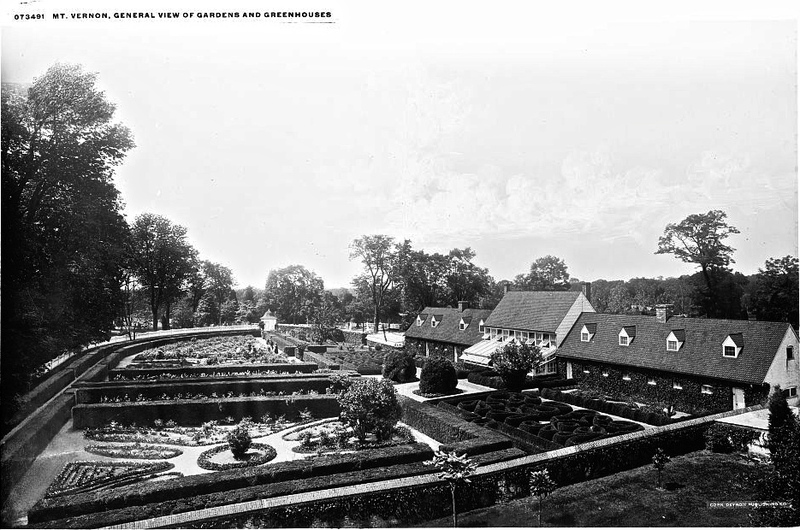 And here is a general view (c.1910 – 1920) of the the Upper Garden by the Detroit Publishing Co. All three images above via the Library of Congress Prints and Photographs Division. The 20th century photos are pretty, but they don’t accurately represent the Upper Garden of Washington’s time. In the late 19th century, restorers thought that the boxwood parterres (many filled with hybrid tea roses) were original to Washington’s time, but research in the 1980s found that they were actually planted in the 1860s or 70s (although they may have been rooted from Washington’s boxwood). The garden was substantially re-worked in 1985, but such is the romantic power of a boxwood hedge that the mid-19th century bushes were largely “kept in place by their own mythology and the mythology they supported of Washington as American royalty,” according to The History Blog, here. 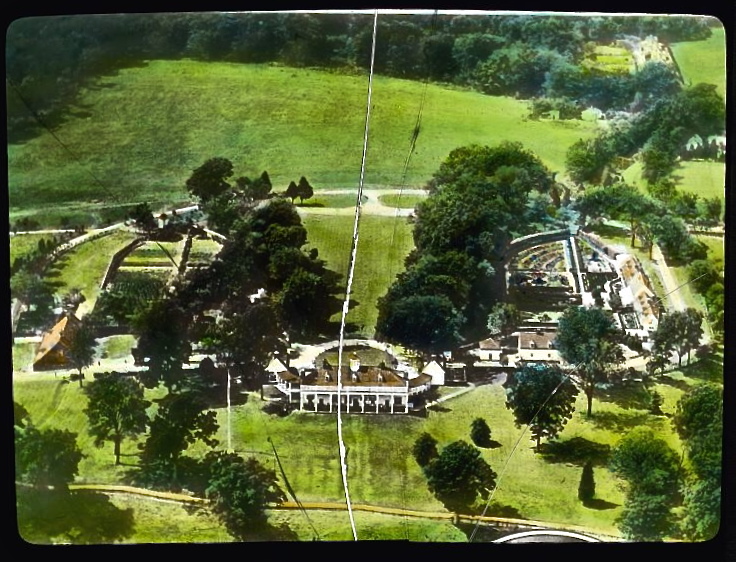 But by the early 2000s, those boxwoods were dying, so the Mount Vernon Ladies’ Association, which owns the estate, decided to make an extensive (six-year) archaeological dig on the site. This culminated in a “new” (1780s) design in 2011. The area now holds large open beds of vegetables and flowers. They are bordered by low boxwood hedges and centered by a 10′ wide gravel walkway. You can read about the restoration in this Washington Post article, here. And I really recommend watching this very interesting 30-minute C-Span video about the research and archaeology that informed it.